Just digging through some old sketches of mine. 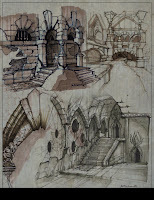 Here is a collection of dungeon sketches I did in 2003 blocking out some visual directions for Dungeons & Dragons Online. An overarching visual idea that I was exploring was a tremendous sense of weight to the architectural elements. The scale of some of the stone work shows carved blocks the size of a 2 meter tall human. Some of the stonework has been repaired over thousands of years so somethings might not look structurally sound. I particularly like the tortured soul sculptured in the lower left, supporting the weight of the dungeon on his head. I left Turbine before getting a chance to use that idea in DDO, but I may have done something similar in Titan Quest Immortal Throne. That game took place in Hades. That visual would have fit in well there too. Good ideas are never forgotten. They just might be put on the shelf for a while.